A Labyrinth is designed to lead you into a center point and bring you back out. Mazes are designed to get you lost after you enter them. This one is patterned after the Chartres cathedral in France. It is designed for walking prayer/meditation purposes. This one has been built in the 2000’s by a father/son team who like to remain anonymous. The grasses have grown up around the coral rocks used to mark the pathways. The red rocks along the edge at the bottom of the image note the shift the sun rises and sets on the horizon as earth tracks through the seasons. There is a matching set on the other side of the circle. This used to be on the world wide labyrinth locator site but no longer is found there. The blowhole should not be referenced in this article as it is not visible from this land and does not have the same gray basalt features as the teeth do. Great information, thank you! Where did you discover that it was made by a father/son team? 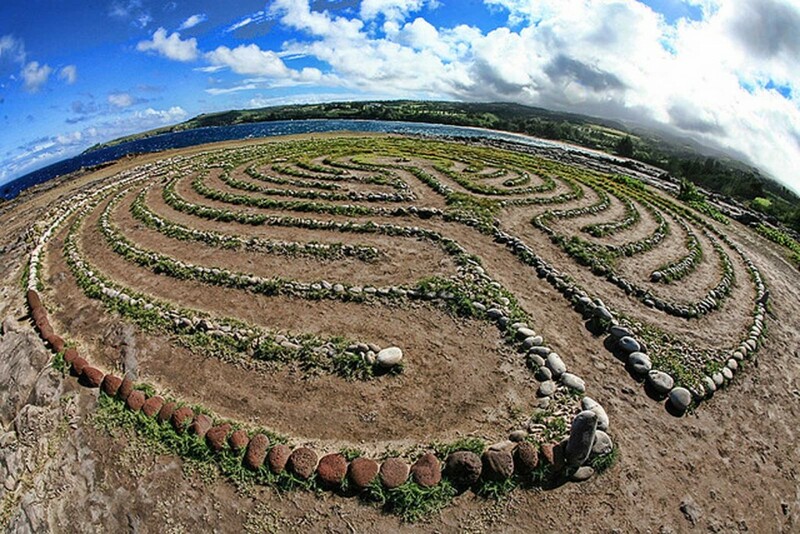 As mentioned, this labyrinth was on this site at one time – http://labyrinthlocator.com/ Right now, there are 20 labyrinths listed on the site for Hawaii. Dragon’s Teeth has been removed from the site. When I visited it in 2005, there were monetary donations in the center bowl. I thought the person on the site noted as the contact for this labyrinth would like to pick up the donations. That reply was informative about the creators and that he was the go-between for them. The father/son team also painted the one at Maria Lanakila church in Lahaina town. The one located at St. John’s in Keokea is approximately half the size of this one at the Dragon’s Teeth, which is over 60 feet. I walked this beautiful labyrinth a week ago and it is in a glorious location on the peninsula. It is not, however, a replica of the Chartres Labyrinth, which I have walked many times. That one has four quadrants of convolutions and one can easily see the four sections, which this labyrinth does not have. This is still a lovely labyrinth and my gratitude goes out to the people who built it! It was a highlight of our stay on Maui! We are in Maui just overnight. How far is the labyrinth from Port? Is it still there? We are going to Hawaii next week. I recently came across this while I driving in this area. I wasnt sure if it was Kapu or if it would be disrespectful to walk the path, but I went ahead and walked it. It wasnt so clear as the photo as it is covered with grass and weeds. It took a few minutes to walk, and I did so with as much genuine respectful and soulful spiritualty as I could muster. When I got to the center, I crouched in front of the stones and at once, my mind began racing. Everything became silent, I could hear only the wind, almost like whispers. I focused on the stones and tried to conjure a coherent thought but my mind was still racing, blurred. So I just I just stayed there for about 5 minutes. If someone saw me they would have said I was deep in thought, but in reality, I was a total void. It was as if my mind was a wheel of fortune, spinning, looking for an honest enough and genuinely spritual place to land on. But all the items on the board were silly, childish nitwitted ruminations or images, memories. Perhaps a question like, what is the meaning of life, but that way too facile and evident. Some deeper, more sublime. The truly important answers that I had been searching for all of my life, but the more I thought of answers, the more questions popped into my noodle. All of a sudden the somewhat frightening hit me, “Whats an average schmuck like me doing here under these circumstances”. And the the wind whipped up and my attention was drawn to my wife, who had been watching me a few feet away. I looked back the piled stones and something hit me in the gut, like a punch. I was winded an was soon overcome by a consciousness welling up inside of me, my own consciousness, the God consciousness, the consciousness of other that had been here before me, an edgy spiritual awareness I have not felt in years. I felt myself letting go, not concerned anymore how silly I might look. Deep and powerful waves drew me into the rocks and blasted out towards me in equally powerful waves. Again I looked up at my wife, she had a bewildered look on her face. The “waves”I now felf had balled inside of me as, not as something ethereal but with a physicality posessing weight and mass, so much so, I was forced to stand. As if the rocks were telling, “Time to go, junior”. So off I went, outward bound, but the way the labyrinth is set up, you depart by a different path. What had seemed a maze or simple ring of concentric circles was actually in itself an eternal answer in itself. Something like, come on the path, seeking, and once found what is sought, leave, but on a different path. Flow in, flow out, much like the tides down below. A mimckry of the eternal life force. As I made my way out, (I payed close attention to the path, because as I mentioned before, it was partially obscured by overgrown grass), my mind and body was reeling. I said to myself, “This cant be happening”, as I am the most unspiritual person, or rather, a selectivley spiritual/religious person(like most humans, I would suppose), to be reflective or spiritual at my own choosing, i.e., a memorial or funeral, a wedding or special mass, bar mitzva, or that moment of silence at the stadium for a deceased home-run hitter. But this was not of my choosing. It was a force completley outside of me, not controlled by me, whose volume knob/on-off switch was completely out of reach. I felt light headed as I neared the exit, and there it was. Againg something up inside my body and soul, making me shudder. I turned to face the inner circle and made a weak attempt to bow, with my hands clasped as in prayer or as a yogi might greet you. My head felf as big as cluds above me, and a final, warm and friendly apprehension came over me. An an epiphany. Once again I looked at my wife(we were on Maui for our 33rd wedding anniversary), and the wind spoke once again. It spoke volumes. Wife. Family. Friends. Love. Tradition. Life. Tears welled up in my eyes. We walked to the car. I had to wait a few minutes composing myself before setting off to drive the somewhat dangerous road back to our rooms at Ka’anapali Beach. Mahalo to whoever assembled these stones. Yes, Maui is a special place on this world. Have been on Maui many, many moons and not been there yet! Going this Friday with visiting friends. Your description brought me to tears and leaves me wondering why it has taken me so long. Aloha mai, aloha aku . . When love is given, love returns!! Beautifully put Rudy. The area where you were is considered by me as a “Spiritual Vortex” of Maui, filled with spirit, love and tradition. Wonderful post. We celebrated our 35th anniversary in January and had taken a walk out to the point and discovered the labyrinth quite by surprise. As already noted it is overgrown. I didn’t walk the labyrinth that time but within a few days we learned our daughter had a miscarriage at home and I felt compelled to return to contemplate, pray for that wee lost soul and for our daughter. I can say it was one of the most poignant time of my life to be out on that windswept point , making that journey, coming to the centre where I left a stone angel ( given to me by a patient I had cared for) and hope that whoever receives the angel will feel the love it contains. I left a piece of my heart there in Maui and hope someday to return.